Prince George of Cambridge (George Alexander Louis; born 22 July 2013) is the only child of Prince William, Duke of Cambridge, and Catherine, Duchess of Cambridge, as well as the only grandchild of Charles, Prince of Wales. He is third in line to succeed his great-grandmother, Elizabeth II, to the thrones of the Commonwealth realms, following his grandfather and father. On 3 December 2012, St James's Palace announced that the Duchess was expecting the couple's first child. The announcement was made earlier in the pregnancy than is traditional as she had been admitted to hospital with severe morning sickness. St Mary's Hospital, Paddington, London, where Prince George was born like his father the Duke of Cambridge in 1982. 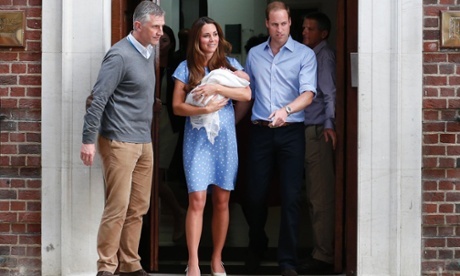 The Duke took two weeks' paternity leave allowed by the Ministry of Defence. The Duchess was admitted to St Mary's Hospital, London in the early stages of labour on the morning of 22 July 2013. 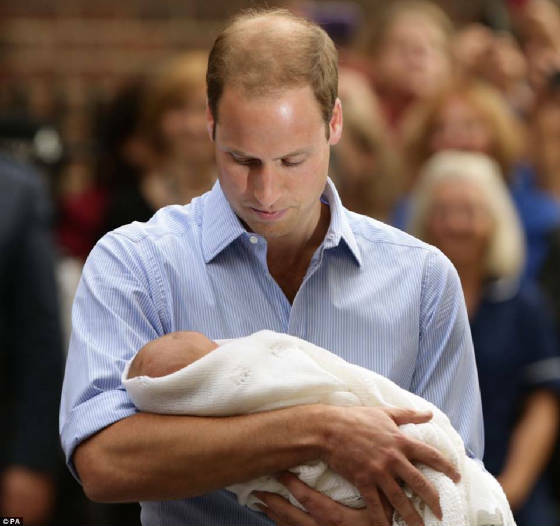 A baby boy was born at 16:24 BST (15:24 UTC) on 22 July, weighing 8 pounds 6 ounces (3.80 kg).The Duke was by his wife's side when she gave birth to the child. which took place in the Lindo Wing of St Mary's Hospital-the same hospital in which Prince William and his brother, Prince Harry, were born to Diana, Princess of Wales, in 1982 and 1984, respectively. The Queen's former gynaecologist, Marcus Setchell, delivered the baby assisted by his successor, Alan Farthing. The customary formal bulletin announcing the royal birth was displayed on an easel outside Buckingham Palace, although in a break with tradition the news was first conveyed in a press release from Palace officials. Gun salutes signalled the birth in Bermuda, in London, in New Zealand, and in Canada; the bells of Westminster Abbey and many other churches were rung; and iconic landmarks throughout the Commonwealth realms were illuminated in various colours, mostly blue to signify the birth of a boy. The pregnancy was described as a source of British national pride.Welsh composer Paul Mealor, who composed "Ubi Caritas et Amor" for the parents' wedding, composed a lullaby entitled "Sleep On", with lyrics by Irish composer Brendan Graham. A recording was made of it by New Zealand soprano Hayley Westenra as a gift for the baby. 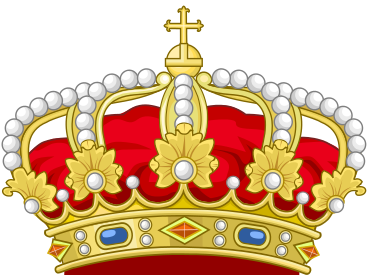 The birth means that three generations of direct heirs to the throne are alive at the same time, a situation which occurred last between 1894 and 1901, in the last seven years of the reign of Queen Victoria. 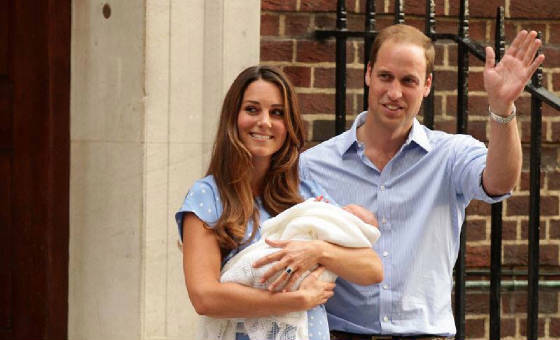 On 24 July 2013, the Prince's name was announced as George Alexander Louis. 22 July 2013 - present: His Royal Highness Prince George of Cambridge - Buckingham Palace announced on 22 July 2013 that the Prince's territorial designation would be "Cambridge". 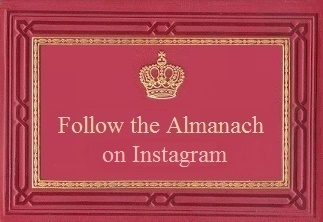 This follows the precedent of having a newborn prince's title containing the same location as his father's title, as was the case for his father who was named Prince William of Wales (son of Charles, Prince of Wales) prior to being granted the title Duke of Cambridge in 2011. 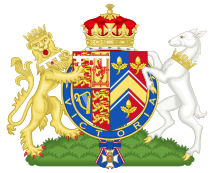 On 11 December 1917, King George V restricted the style Royal Highness with the princely title to the children of the sovereign, the children of the sons of the sovereign, and the eldest living son of the eldest son of a Prince of Wales. 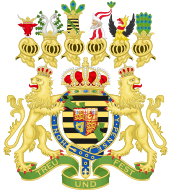 As the eldest living son of the Duke of Cambridge, who is the eldest son of the Prince of Wales, George Alexander Louis is entitled under this rule to the princely dignity and style Royal Highness. 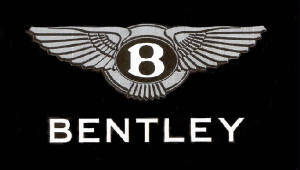 Any of his future siblings would have been styled Lord or Lady; however, this was amended on 31 December 2012 by Queen Elizabeth II, who issued letters patent granting all children of the eldest son of the Prince of Wales the princely title and style of Royal Highness. He is third in the line of succession to the thrones of the 16 Commonwealth realms. He is preceded by his grandfather and father.